When administrator users with the correct permissions are unlocking a locked evaluation document, all other locked version are deleted. Documents under evaluation processes of the same name with the same document configuration, meaning: document, the term started, and term finished, will be deleted for all processes. The evaluation workflow functionality is an alternative to using the manual evaluation process in FACULTY180. Evaluation workflows are useful if the workflow steps are the same for each unit, such as for a tenure review. For example, in a tenure review, the steps are combined to create a workflow. When using the evaluation workflow functionality, there is no longer the need to create individual evaluations evaluations are created during the evaluation process setup. When creating titles for evaluation workflows and processes, it is recommended that a naming convention be developed that will govern and assist in tracking them across the institution. Typically, a title for an evaluation workflow should be more general (e.g. Tenure Review). The title for an evaluation process should include a related time period (2015 2016 Tenure Review) and the evaluation title should be further detailed to include the nature of the evaluation and the unit name (e.g. Chairs Evaluation Accounting Department). Click Evaluation Workflows in the Evaluations section. 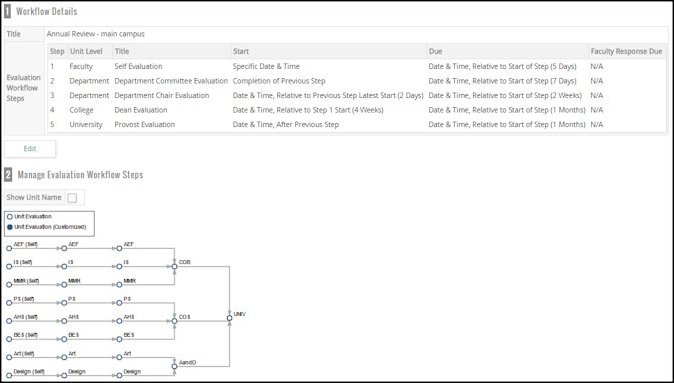 The Evaluation Workflows screen displays. Click Add. The Evaluation Workflow Form screen displays. Complete each of the sections. Evaluation Level:Select the unit for which the evaluation workflow is being set up. Click theChangelink to change the Unit. The org Structure displays. By default, the Organization abbreviations aredisplayed. To view the full name of the unit, click theFull Namecheckbox. Title: Type a name for the evaluation workflow. A title for an evaluation workflow should be more general (e.g. Tenure Review). Type: Select the type of evaluation for which the workflow is being created . (If the appropriate type is not listed, additional types can be added by modifying the Evaluation Type activity classifications). Access to Results: Specify who should have access to the evaluation results based on evaluation processes and access to reports. Description: Type a description of the evaluation workflow, if desired. The evaluation results can be viewed by the faculty member being evaluated. The evaluation results are hidden from the faculty member being evaluated. Faculty can view author names Faculty members can see the evaluation author names when viewing evaluation results. "Name Withheld" displays in place of the evaluation author names when faculty members are viewing the evaluation results. Evaluators in this evaluation can view results submitted by other evaluators in this evaluation (e.g. Peer evaluators have access to view each others' evaluation results) The evaluation results can be viewed by other evaluators in the same evaluation. (When there are multiple evaluators such as in a committee review, and each is also an 'author', meaning that each one will submit a separate evaluation, then they are allowed to view the evaluations submitted by other authors.) The evaluation results are hidden from other evaluators in the same evaluation. Evaluators in other evaluations of this evaluation process can view these results (e.g., college-level tenure evaluators have access to the department-level tenure evaluations) The evaluation results can be viewed by all evaluators in the same process. (e.g. In a process titled Tenure Review, if this is the chair's evaluation and the next step in the Tenure Review process is the Dean's evaluation, the Dean can view the results of the Chair's evaluation.) The evaluation results are hidden from any other evaluators in the same process. Evaluators in other evaluation processes can view these results (e.g. tenure committee evaluators have access to the annual evaluations) The evaluation results can be viewed by evaluators in a different process. (e.g. If there are two processes happening at the same time, perhaps a process titled Tenure Review and process titled Annual Review, the evaluators in the Tenure Review process can see the results of the evaluations from the Annual Review process.) The evaluation results are hidden from evaluators who are involved in different evaluation processes that are happening at the same time. Evaluation can be viewed in evaluation reports with respect to Units The evaluation results can be viewed by anyone who has administrative access to the faculty member's 'primary unit' and also has access to evaluation reports. (If a Chair/Dean has administrative access to his/her department/college and he/she also has access to evaluation reports, then he/she will see the evaluation results for all faculty members in his/her department/college.) The evaluation results are hidden from evaluation reports for any administrators in the faculty member's primary unit. Evaluation can be viewed in evaluation reports with respect to Faculty The evaluation results can be viewed by anyone who has administrative access to the faculty member's 'secondary unit(s)' and also has access to evaluation reports. (If the faculty member has a secondary assignment to a department/college, the Chair/Dean of the secondary department/college will have access to the evaluation results for any faculty member who is secondarily assigned to his/her department/college if the Chair/Dean has administrative access and also has access to evaluation reports.) The evaluation results are hidden from evaluation reports for any administrators in the faculty member's secondary units. Evaluators can export evaluation results after saving The evaluation results can be exported (printed or printed to PDF) after the evaluation results are 'saved' but before the evaluation has been submitted. (Completing an evaluation is a two-step process. The evaluator completes and saves the evaluation form, then the evaluation is 'submitted' to end the evaluation process. The evaluation results cannot be exported when saved. Documents that are part of an evaluation workflow, such as vitas and faculty classifications forms, can easily be added to an evaluation workflow. These documents should be created prior to creating an evaluation workflow. In the Evaluation Documents section, click Add. The Add Document dialog box opens. Select the Document Type (Vita or classification form). Show Time Period on Vita: Select the checkbox to show the time period on the vita. This option is selected by default. Unselect the checkbox to hide the academic terms on the vita. 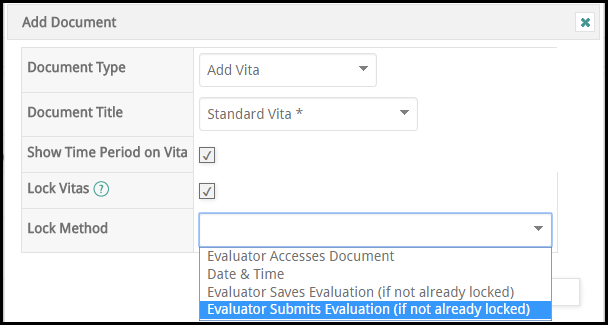 Evaluator Accesses Document: The vita/classification form will be locked once the evaluator accesses the document by clicking the icon. Date & Time: A specific date and time can be selected for locking the vita/classification form. Evaluator Saves Evaluation: The vita will be locked when the evaluator saves the evaluation (if the vita has not already been locked). Evaluator Submits Evaluation: The vita will be locked when the evaluator submits the evaluation (if the vita has not already been locked). After the lock occurs,if the faculty member adds or edits his/her activities in any sections (on any Activities form), the new and/or edited data will not be added to the template. The template is locked from any modifications made by the faculty member. If the vitatemplate is locked at one step in the evaluation workflow, it should be locked for every subsequent step to maintain the integrity of the template. This ensures that every evaluator in subsequent steps performs their evaluation based on the same vita template. When thelock occurs, a snapshot is taken of the vita template and this becomes part of the evaluation results. This allows a faculty member to view the vita template that was used during the evaluation at the same time that they are viewing the evaluation results. Selectingto lock a vita template at a specific step in the evaluation workflow is a strategic decision. Click Save. The selected document is added to the evaluation workflow. To add another evaluation document, click the Add button and repeat the process until all of the documents have been added. There is a default evaluation form which consists of a Standard Input Box and the option to upload attachments. 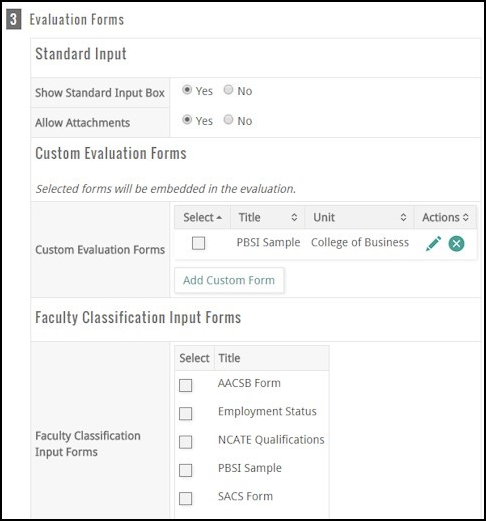 Custom forms (evaluation forms and faculty classification input forms) can be created to use in place of the default evaluation form. This is a recommended practice since a custom form will more closely meet business process requirements. Show Standard Input Box: SelectYesto add the default input text box to the evaluation form. Allow Attachments:SelectYesto add the option to upload attachments as part of the evaluation. (Note: If both the Standard Input Box and the Allow Attachments is set to No and there is no custom form selected for the evaluation, the evaluation form will be blank). 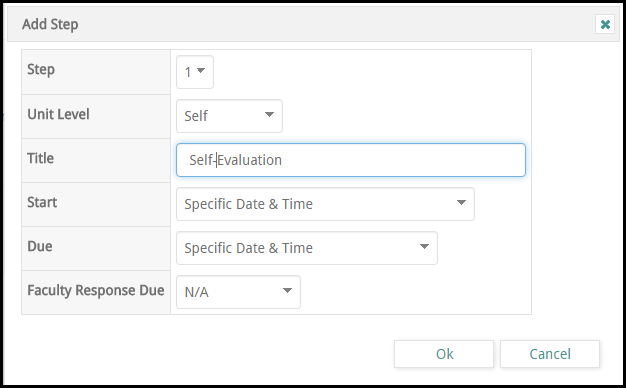 Custom Evaluation Forms: A custom evaluation form can be created to be used with an evaluation workflow by selecting the checkbox next to the form title. It is recommended to create all custom forms prior to creating a workflow. Faculty Classification Input Forms: To use a faculty classification input form as an evaluation document, select the check boxes for the desired form(s). It is recommended to create all faculty classification input forms prior to creating a Workflow. To create a faculty classification input form, see Input Faculty Classifications: Create Input Form. Once the details and documents have been specified for an evaluation workflow, the workflow steps must be determined. To add a step to an evaluation workflow, click Add Step. Step: Specify where in the evaluation workflow this step should occur. A step can be removed by selecting Remove in the Step drop-down. Unit Level: Specify at what unit level this step will be performed. The level options relate to the configuration of the organization structure. These levels were determined during the Implementation phase. Start/Due: Specify the start and due dates for the evaluation workflow. Use the table below for assistance with specifying the start and due dates. Faculty Response Due: If faculty will be permitted to respond to the evaluation, select 'Relative to Due' from the drop down and then specify the number of days the faculty will have to respond. Specific Date and Time Manually specify the start date and time using the DateTime picker. Date & Time, Relative to Step 1 Start The start date/time of the step is set relative to the start of Step 1 (e.g. Step 3 starts 10 days after Step 1 starts). This option is also applicable to concurrent evaluations. Date & Time, Relative to Step # Latest Start This step allows the administrator to define which step they want the start time to be relative to, plus any additional days. The step will default to the previous step. To change the step, select the appropriate step from the Step drop down, plus any additional days. This option and the Date & Time, Relative to Step 1 Start option are applicable to concurrent evaluations (e.g. Step 2 starts, then Step 3 will start one hour after Step 2 starts, and Step 4 will start one hour after Step 3 starts). Date & Time, After Step # The step will start after the specified step ends, plus any additional days. This takes into account the due date of the specified step, plus any additional faculty response times (e.g. Step 2 starts on a Monday at 8 a.m. and is due in three days - Thursday at 8 a.m.). There is a faculty response due in four days (after the due date) - the next Monday at 8 a.m. Step 3 (with this option selected) would then start on the next Monday at 8 a.m. Completion of Previous Step While the start date will be set in the same manner as the Date & Time, After Previous Step option, evaluations can begin before the start date on a per faculty basis. Step 1 is a self-evaluation, starts on a specific date, and is due in one week. Step 2 is a chair evaluation and is set to Completion of Previous Step. The system will set the start date to after the due date (one week) of the previous step. John Smith (faculty being evaluated in this processes) finishes their evaluation before the evaluation is due. The Chair in Step 2 can immediately begin their evaluation of John Smith (before the start date of the evaluation). Completion of previous step looks at all previous steps. This assists with concurrent evaluations and evaluations that have multiple steps with varying faculty members. Notifications can be configured to automatically send an e-mail message on the first 'early access' evaluation or 'for each evaluation' evaluation, as they are made available. Notification can also be configured to send an e-mail to the evaluators of the next step when all of the previous evaluations for a faculty member have been completed by selecting 'Upon Completion of Last Evaluation'. Once an evaluation officially starts, no early access notifications will be sent. For a step to completed, all authors must submit their evaluations at that level for a given faculty member. In addition, if the step is configured for a faculty response, the faculty response must be completed before it is made available to the next level. Notifications for early access will be sent to the evaluator as an e-mail message. In addition, a message will display in the To Do section on the Dashboard for the evaluator, alerting them of the early access to an evaluation. Click Save and Customize Steps to make adjustments per step to any of the evaluation details. The Evaluation Workflow Steps are shown. Caution: Modifications to the workflow should not be done during an active evaluation process. This will damage any evaluation processes and evaluations that were created b based on the workflow. The evaluation workflow steps can be modified to select the evaluation forms appropriate for each level of the evaluation. For example, if a faculty self-evaluation form and committee evaluation form were both selected in the workflow creation, the Faculty Self-Evaluation step should be modified to unselect the committee evaluation form. Likewise, the Committee step should be modified to unselect the faculty self-evaluation form, leaving only the committee evaluation form selected. click the relevant node on the diagram. The Evaluation Workflow Form screen displays for the selected unit level. Click Save to apply the changes to just the selected unit level. Click Save and Copy Changes to Other Units to copy the changes to other unit levels. You will be prompted to select the units that are to have the changes applied. To return to the workflow diagram without making changes, click Cancel. If a change has been made to a unit evaluation, the node turns to solid in the diagram.